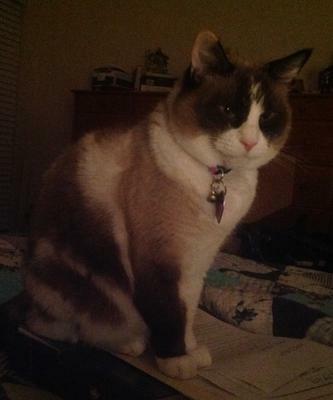 Eight years with intelligent female Snowshoe cat. Travels well, vocal, playful, opens doors and dippers her water. Surprisingly therapeutic, always giving arm and hand kisses - such a caretaker. Such beautiful markings, and what a character, so playful and affectionate. Gorgeous Ezzie! Angels watch over buddy and guide him Home. My father's Siamese was missing for 3 months - China returned in bad shape almost unrecognizable. Likely he repeatedly escaped predators or was trapped for a long time. Keep watch! I had a cat that looked very similar to Ezzie. His name was Buddy, and I had him for over eight years. He was declawed and strictly an indoor cat. We went camping last weekend, something we had done many times. For some reason, he bolted out the door, and we haven't seen him since. I loved him with all my heart. Unfortunately, he escaped in an area located next to a small lake, with desert landscaping (near Phoenix, AZ). He's been gone now for over two weeks, and I know I'll never see him again, and I miss him so much. I was terribly depressed for two weeks and more. I loved him very much, but I'm sure he didn't survive. God bless you Buddy.